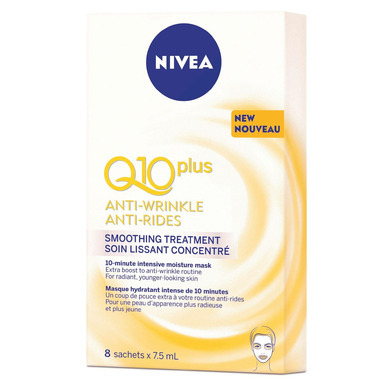 Nivea Q10 Plus Anti-Wrinkle Smoothing Treatment is an effective way to boost your anti-wrinkle routine. Produced naturally in our body, Coenzyme Q10 plays an essential role in helping the skin produce the energy needed to help maintain and improve skin's elasticity. It effectively fights wrinkles from within, reduces their appearance and the visibility of dark spots. So you know how there are products all over the place that claim to be miraculous and effective and they end up being as useful as smearing margarine on your face? This product is NOT one of them! After only one use, my skin was significantly softer the next day, supple, and, believe it or not, actually younger looking. I was super skeptical but love Nivea products, especially the Q10 day face cream, so decided to give it a try, and holy moly does it deliver. I can't stop touching my face.